It’s a whole new experience being a mom on the beach, and I’m just gonna put it out there.. a whole new experience as a single mom on the beach. I’m sure it gets easier as they get older but with an 18 month old.. Fun.. but not so easy. Liza did not respond to the pool so much but when we went down to the beach her eyes lit up and she started squeeling and squirming to get out of my arms. She got her feet on that sand and wiggled her little toes in it and took off towards the waves! 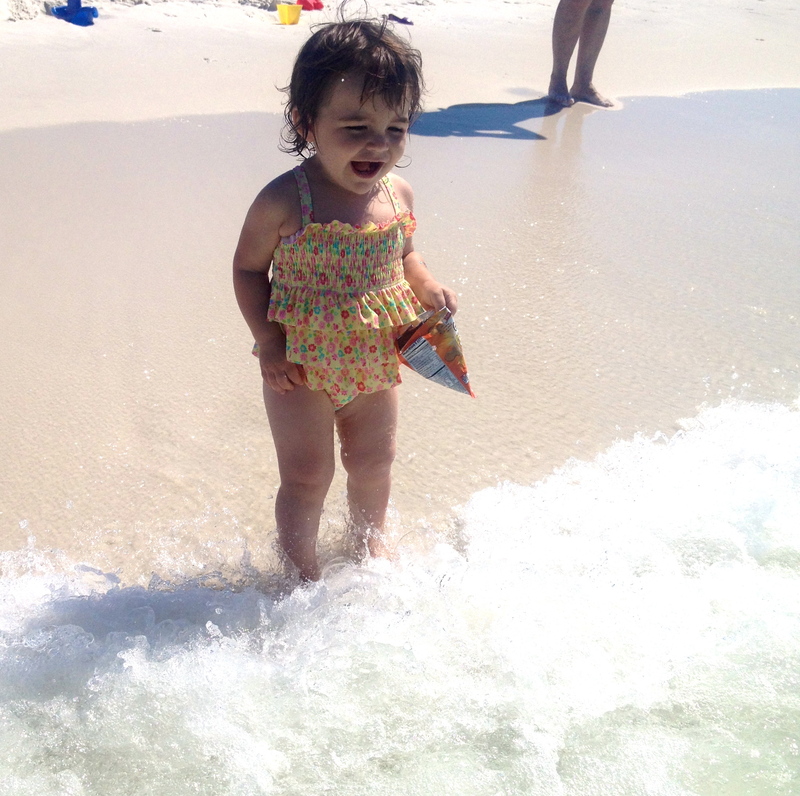 Oh she was so cute running into those waves for her first time and she just giggled her little chuckling laugh. That in itself makes this whole trip so amazing. This was followed by me jumping the waves with her and then following her every step down the beach and catching her every fall. This is great but it is exhausting.. those days of laying out on the sunny beach with my bikini, reading a magazine and just soaking up the sun and listening to the waves crash while I doze off are gone. I did decide one afternoon, thanks to Grandma babysitting while Liza was napping, and my sisters family was out at one of those crazy go cart fun extravaganzas, to go out to the beach and try to get that amazing sun soaking experience that I longed for. I put my cute bikini on.. I had been wearing my tankini for running around with Liza.. and I packed a couple Coronas and walked down to the beach. The whole time giving myself a pep talk on how I can sit on the beach by myself and enjoy my time and relax. This entry was posted in Mommyhood and tagged baby, family, mom, single mom. Bookmark the permalink. Oh Tammy, you would be such a great catch for any guy, and not just because you’re physically beautiful! You’re worth way more than that! I can’t imagine the void/loneliness, but keep your chin up! You are so loved by many, and that special guy might not just hit on you on the beach, but get to know you first, if you know what I mean. 😉 PS I love the pictures! Thanks Angie! I will definitely wait for the guy that gets to know me first, no worries there:) Chin’s up!